Home > SHARE - IPO > ICICI Lombard – Should you invest in this IPO? ICICI Lombard IPO - Should you invest in this IPO? ICICI Lombard IPO would open for subscription on 15th September, 2017. 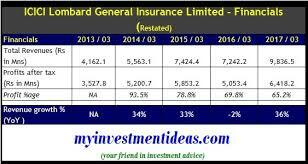 ICICI Lombard General Insurance Ltd is the largest private-sector non-life insurer in India. ICICI Lombard General Insurance is part of ICICI Group. Its revenues grew at 24% CAGR in last 5 years.